When I have the time, I really like to make my own gifts rather than finding something at the shop. As well as being thrifty (sometimes) and creative (sometimes! ), I like to think the time, effort and love that went into the gift is more than it would be if I’d bought the gift and… it means I don’t have to go near a mall – a huge bonus for me! Christmas is usually crunch time with many many gifts to make, buy, think of. This past Christmas, I managed to make quite a few of the family gifts for the women (women are so much easier than men!) and my go to idea was a zipper pouch. 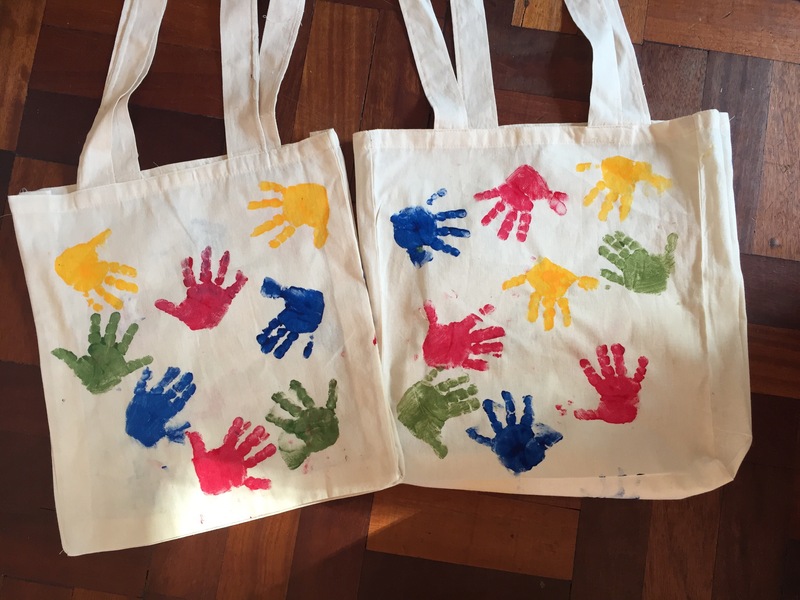 I made some in cotton Shwe Shwe off cuts and then also some in a cream canvas that I had hand printed with the girls previously as part of an “art project”. The pouches are all lined (sorry no picture). 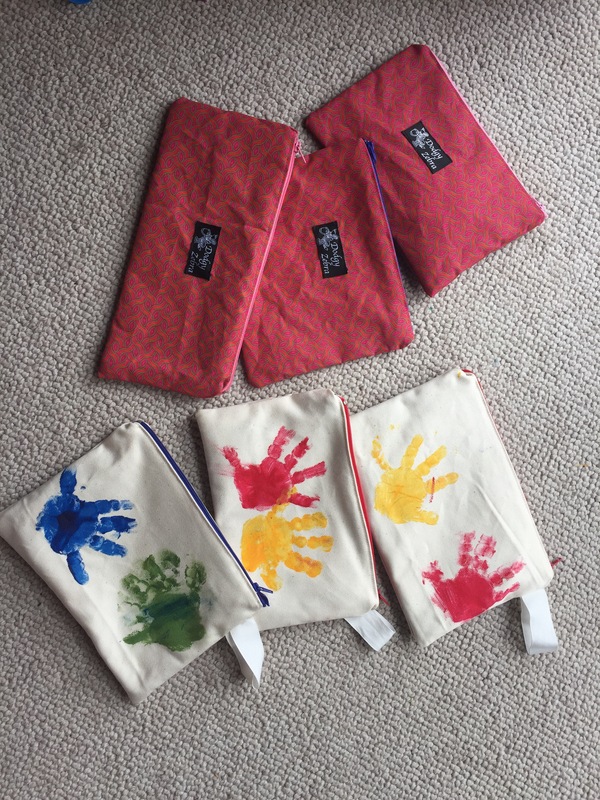 The Shwe Shwe ones are lined in bright green cotton and the hand print ones are lined in PUL left over from my nappy making. The pattern is basically one that I’ve figured out as I went along but there are hundreds of tutorials out there and I particularly like the ones by Ros from Sew Delicious because they are clear with great pictures and it looks like she’s made a few thousand pouches in her time! When I started running out of time and energy for sewing zipper pouches (and realised that my family has increased in size since I’ve returned to South Africa! ), I fortuitously came across some plain canvas shopping bags. 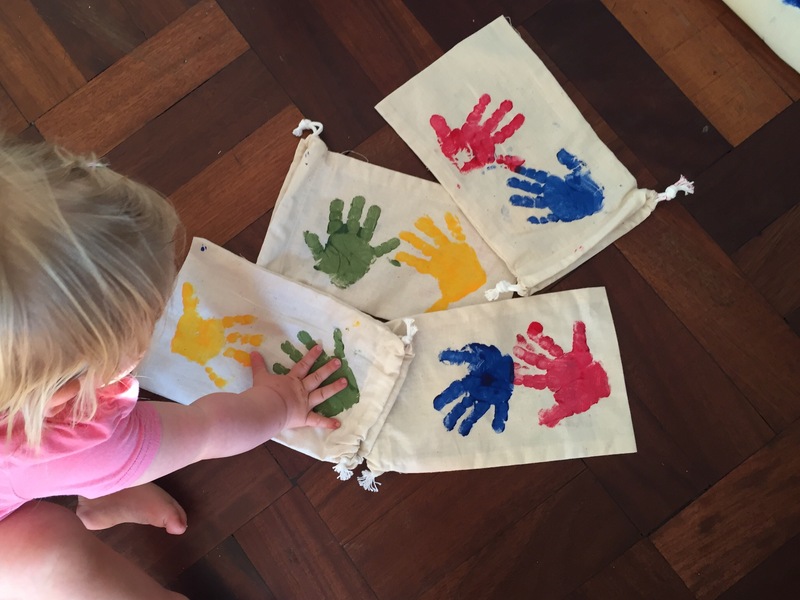 I them snapped up and had lots of fun making hand prints with the girls. I did consider trying to be a bit more creative (I’ve seen fun versions where hands are turned into owls, feet into butterflies etc) but my artistic skills weren’t going to extend that far. The gifts were very well received and I had fun putting them together. Now for ideas for this year…? Those pouches and bags make great gifts – they’re hand-made and they’re useful. I also enjoy making gifts for people around Christmas, especially since it keeps me away from shopping centres. It comes with a great bonus of feeling much more relaxed! Hi Katie, hand-made gifts are the best! I just have to find the right balance between something useful that doesn’t take too long to make. Yes, I should probably start thinking of ideas for this Christmas already but I’m not usually that organised! Any great ideas…send them this way!